The Wyoming state motto was adopted in 1893 by state Legislature and the Wyoming motto is featured as part of the state seal. 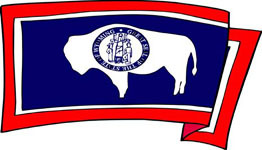 The Wyoming motto "Equal Rights" is a proud statement of the high status Wyoming through history has attributed women. The motto refers to the year of 1869 when the Wyoming Constitution as the first 'modern' state granted women the right to vote and to hold public office. However, as 'modern' the equality thought might seem, it does bear to mention, that the reason behind allowing women to vote was not to benefit women as such but to ensure enough votes so the population requirements for statehood could be met. "The Equality State" or "The Suffrage State"
As mentioned above, in 1869 Wyoming was the first state to allow women the right to vote. This grant first gave Wyoming the nickname "The Suffrage State" which later turned into "The Equality State". The Wyoming nickname "The Equality state is also mirrored the state motto. 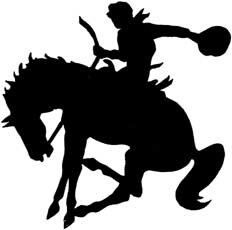 The state symbol is a cowboy on a bucking horse. This image has developed into "The Cowboy State"
Just like Nevada, this widespread wild sage in some state areas are the reason for this Wyoming nickname. Wyoming is the 10th biggest state in total size. Wyoming is a land of varied but rough land, from Great Plains to Rocky Mountains. "Wyoming: Like No Place on Earth"
This is a Wyoming state slogan that among other things appears on road signs. 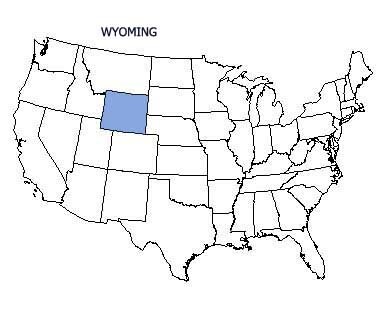 "Wyoming: Where Men are Lonely and Sheep are Scared"
"Wyoming or Just a Rectangle? Who Gives a Crap"
"Wyoming: Birthplace of Gay Rodeo"
Some of these Wyoming funny state slogans can be bought on various souvenir items such as t-shirts and stickers. Or maybe Alabama, Alaska, Arizona, Arkansas, California, Colorado, Connecticut, Delaware, Florida, Georgia, Hawaii, Idaho, Illinois, Indiana, Iowa, Kansas, Kentucky, Louisiana, Maine, Maryland, Massachusetts, Michigan, Minnesota, Mississippi, Missouri, Montana, Nebraska, Nevada, New Hampshire, New Jersey, New Mexico, New York, North Carolina, North Dakota, Ohio, Oklahoma, Oregon, Pennsylvania, Rhode Island, South Carolina, South Dakota, Tennessee, Texas, Utah, Vermont, Virginia, Washington, West Virginia, and Wisconsin.